FlipperHost.com, Service Level Agreement (Last Rev. 01/01/2018). This web site availability Service Level Agreement (SLA) applies to you if FlipperHost.com, (hereafter referred to as FlipperHost, we, us or our) is providing Service to you and your account is in good standing. Terms not defined in this SLA have the meaning given to them in your agreement. FlipperHost endeavors to have network connectivity available by http access by third parties 99.9% of the time (Web Site Availability). In order for you to receive a credit, you must request the credit within 7 business days after you experienced Web Site Unavailability. Web Site Unavailability means: your web site is not responding to http requests, or unavailable via the http protocol. You request credit by sending a request to our billing department through our helpdesk (billing@flipperhost.com). The message must originate from the primary email we have in our records for you, and contain your domain name, the dates and times of the unavailability of your web site, and any other customer identification requested by FlipperHost. Credits will typically be applied to your account within 7 days of your credit request. This credit is your sole and exclusive remedy for our failure to meet the Web Site Availability SLA. The statistics generated by our internal monitoring services are the final determination of the uptime of our service, and not any one client's experience. Credits will not be provided to you in the event that you have no Web Site Availability because of: (i) scheduled maintenance, (ii) your behaviour or the performance or failure of your equipment, programs or applications, or (iii) circumstances beyond FlipperHost's reasonable control, including, without limitation, acts of any governmental body, war, insurrection, sabotage, embargo, fire, flood, strike or other labor disturbance, interruption of or delay in transportation, DDoS attacks (distributed denial-of-service), unavailability of interruption or delay in telecommunications or third party services (including DNS propagation), failure of third party software or hardware or inability to obtain raw materials, supplies, or power used in or equipment needed for the Services. FlipperHost does not restore your data to the server and is not responsible for loss of your data. We strongly recommend that you purchase backup options for your server, and keep copies of your data off-site with you for emergency purposes. If hardware failure and data loss occur, you the client, are responsible for data restoration. FlipperHost shall not be liable for loss of data under any circumstance. Hardware replacement will occur within 1-3 hours from your report of a problem. 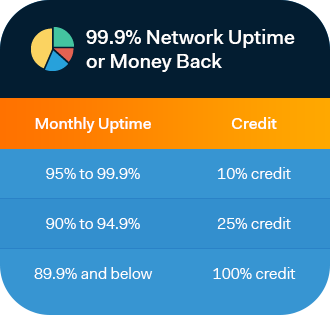 FlipperHost will refund 5% of the Fee for each additional 3 hours of down time (up to 100% of your Fee). In order to reduce replacement hardware downtime, we keep a certain quantity of pre-built systems on hand to swap out hard disks so that your server can be back up in the shortest amount of time. For hard disk failures, we keep pre-installed drives with our standard partitioning for immediate deployment. In order to request a SLA hardware violation credit, you must contact our sales department through our helpdesk. SLA violations will be reviewed by our personnel Monday - Friday 9AM to 5PM EST.